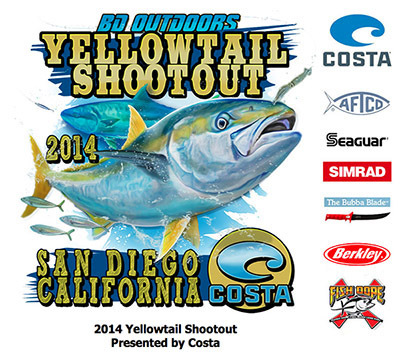 The recent 2014 Yellowtail Shootout was a great success and BD would like to thank the teams who fished and industry partners who made it all possible. We give special thanks to our headliner sponsor, Costa, who has been supporting the Shootout for three years in a row. Also thanks to the many other companies who helped make the angler’s bags awesome and the raffle prizes over the top. On hand we had booths for Mad Hueys, Make-a-wish, Navionics showing their sonar mapping technology and Berkley. We’d also like to thank the sponsors of the angler bags this year… Costa, Aftco, Berkley, Brandt Beef Jerkey, JRI Custom Lures, Mustad, Mad Hueys, Get Some! 1000, Hoo-rag and Pacific Coast Sportfishing. 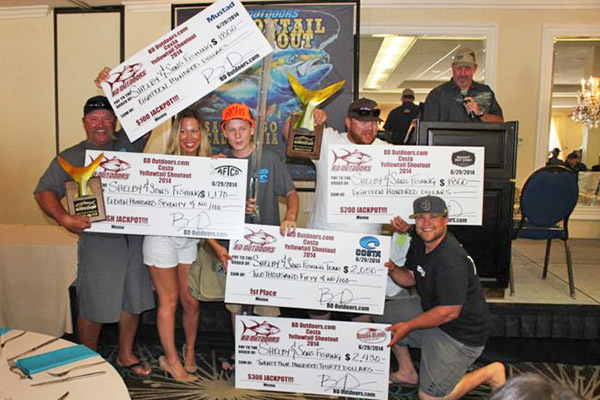 The fishing was good and the winners were celebrated at a fantastic awards ceremony at the Kona Kai Resort. 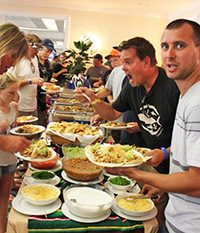 Anglers enjoyed a huge Mexican buffet and great camaraderie. When everyone was full and rehydrated, the winners were announced and presented their trophies, prizes and checks. Winning 5th place was team #26 Catcin Da Keepers with a bag weight of 35.6 pounds which gave them $205, an Aftco Performance shirt, Everingham Bros. bait certificate, a Bubba Blade, $50 gift certificate to Dana Landing and a 1 year subscription to FishDope. Team #9 Aherns Anglers took 4th place with a weight of 41.1 pounds aggregate. This earned $310 dollars, an Aftco Performance Shirt, a pair of Aftco shorts, an Aftco hat and $60 gift certificate for Aftco apparel, $50 gift certificate to Dana Landing and a 1 year subscription to FishDope. Third place was presented by FishDope and was received by team #36 Shenanigans whose fish totaled 49.0 pounds. They collected $410 dollars and a pair of Costa Del Mar sunglasses, an Avet SXJ, $100 Gift Certificate for Aftco apparel, $100 gift certificate to Dana Landing and a 1 year subscription to FishDope. Second place was taken by team #5 Megabite with a bag weight of 58.8 pounds which netted them $1,,025 dollars and a pair of Costa Del Mar sunglasses, 3 Aftco performance shirts, 3 pairs of Aftco board shorts, an Accurate 600 narrow, $100 gift certificate to Dana Landing and a 1 year subscription to FishDope. 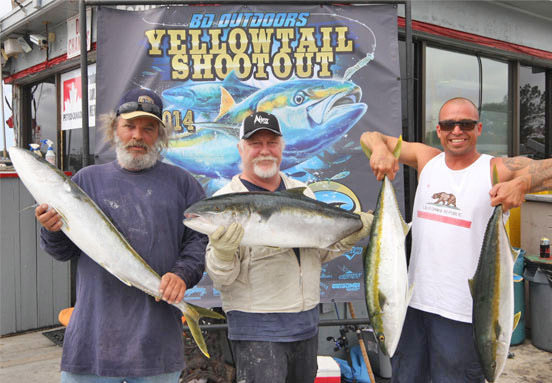 The first place winner of the 2014 Yellowtail Shootout was team #37 Shelby and Sons Fishing Team with a total weight of 59.6 pounds. 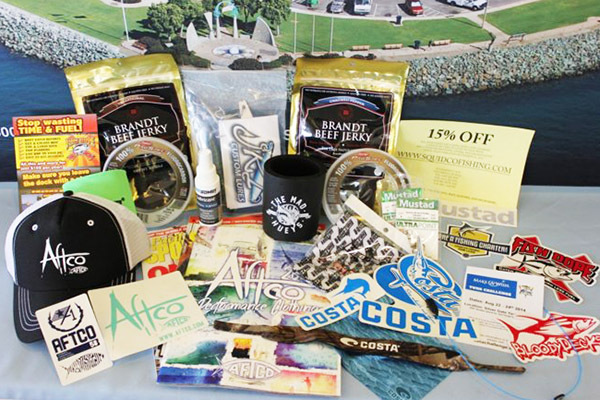 They were presented $2,050 dollars, 4 pairs of Costa Del Mar sunglasses, 4 Aftco Hats, a Navionics Map, a Salty Dawg Custom Rod, an Avet SXJ, Mad Hueys prize bag, $200 gift certificate for Dana Landing and a 1 year subscription to FishDope. Shelby and Sons also went all in and walked away with all 4 jackpots. They claimed the Big Fish Jackpot with a 24.9-pound tail that was good for 1,170 dollars. They also grabbed 1,800 dollars in the $100 jackpot, $1,800 in the $200 jackpot and $2,430 in the $300 jackpot for a grand total of $9,250 in cash. 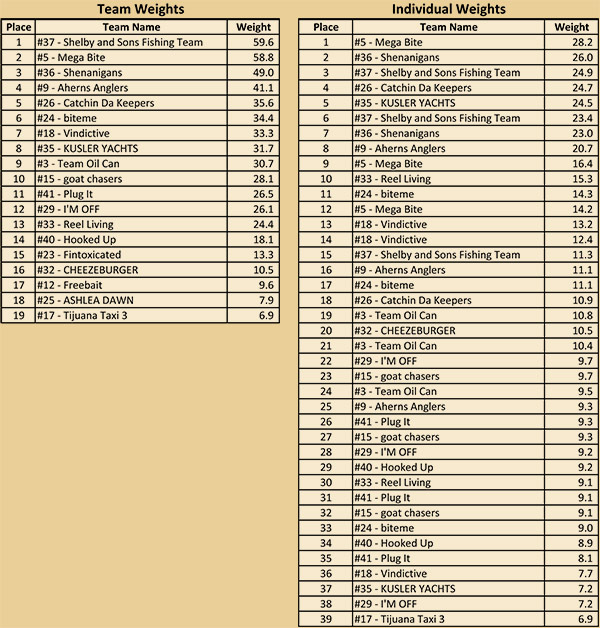 Congratulations to all of teams who fished the tournament and had a great time. BD gives thanks to all the teams, partners and volunteers who made this year’s tournament a huge success.